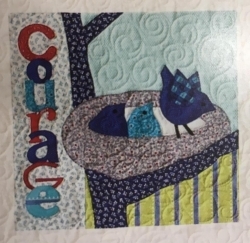 Join us for a fun relaxing Block of the Month using applique, and fun applique techniques. This class is a fun way to play with applique and have a great stitch and social session! We will be cutting out our fabric and sticthing as much as we can to make each block during class. You have the option to mke the full quilt, or to make individual pillows or wall hangings as well. This is a wonderful beginner's or intermediate class! Finished size is 14" x 14"
1 top Left background block of 4.75" x 14.5"
1 Top Right background Block of 10.25" x 9.5"
1 bottom right background block of 10.15" x 5.5"
Assorted scraps for birds and letters.